It's got a bit of the New Orleans traditional feel in that it uses tuba and there's no piano. I always love Dwight Adam's playing.I think he is especially gifted at the blues. "Deneka's Chant" evokes a Sun Ra feeling. "Vanessa's Dance" tought me something. I feel like there are words coming through even though it's all instrumental. The drama and mood swings of "It's Now" work well as does the ensemble lead lines on this and "May Be Blue". The extended blues, "Crazy Over You", Roman Filiu plays some great counterpoint to Dwight's melody. 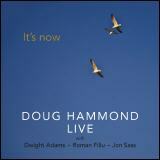 ( as arranged by Hammond) You (Doug) spice and sometimes play the melodies with well-placed accents and fills. And again, praise you for being a drummer and not a cymbalist.